High Quality Content by WIKIPEDIA articles! Baron Chelmer, of Margaretting in the County of Essex, previously Sir Eric Cyril Boyd Edwards, (9 October 1914 3 March 1997) was an English solicitor and organiser for the Conservative Party. He was Chairman of the National Executive Committee of the National Union of Conservative and Unionist Associations from 1957 to 1965, and Joint Treasurer of the party from 1965 to 1977. 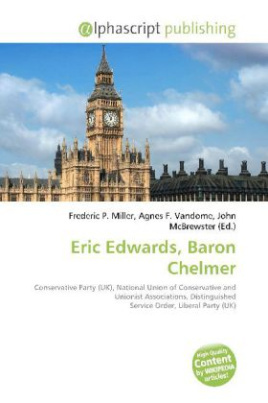 Eric Edwards was the eldest son of Colonel C E Edwards DSO, a solicitor and Liberal councillor. He attended Felsted School, and gave up his early hope of becoming a diplomat to enter his father's firm of solicitors, after taking an LLB at the University of London. He joined the Essex Yeomanry, which in World War II became 147 Field Regiment the Royal Artillery. He fought in the invasion of France, winning a Military Cross in 1944, and gaining the rank of lieutenant-colonel. He was commanding officer of the Essex Yeomanry in 1945 6. After the war, he and his father joined the Conservative party.